If you want to produce long lasting designs then you have to ensure that you flowers are properly prepared for the job. Poorly conditioned flowers look miserable limp and will be dead within a couple of days – the last thing you want particularly if you are creating an arrangement for someone else. Generally how you condition a flower depends on the type of stem it has. They can be woody, hollow, soft, firm, bulbous and latex producing. Flower/plant food is available at all florist wholesalers or good high street florist and should be placed in the water for added conditioning. And always make sure that when you are conditioning flowers the bucket you place them in is clean. Examples include: roses, pittosporum, lilac, azalea, virburnum, rhododendron and eucalyptus.Stems should always be cut at an angle. Don’t cut them straight as this forces the stem to rest on the bottom of the container and restricts water intake. The stem end should be split about a centremetre. Remove all lower foliage which would lie below the water line and place in warm water. Examples include: delphiniums, gerbera, lupins and alliumsHollow stem flowers are well known for forming air locks when the stem is cut. Cut stems at an angle; remove lower leaves before turning the stems upside down and filling with cool water. Plug the stem with cotton wool then place in water. Examples include: freesia, anemones, and hellebore.Stems should be cut at an angle and all lower foliage removed. Immerse flowers in water up to their necks overnight. Examples include: hydrangeas, some rosesCut stems at an angle, remove all lower leaves and immerse in warm water overnight. Examples include: daffodils, tulips, hyacinths etcSince most of these flowers are pulled from the plant and not cut you should cut off the end of the stem which is white and firm and does not allow the uptake of water. Condition in cool tepid water unless you want the flower heads to open whereby you should immerse in warm water. Examples include: poppies, euphorbiaWhen cut, the stems of these flowers produce a milky substance known as latex. This is poisonous to other flowers sharing the same water and can also be an irritant to human skin. The stem ends should be cut (wear gloves), lower foliage removed and then the stem end should be quickly passed through a flame to seal it. Place immediately into tepid water. Roses: always remove the thorns taking care not to damage the stem as this can allow bacteria to get it. 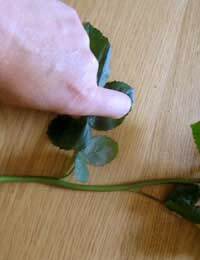 Remove all lower leaves and recut the stem at an angle before placing the rose in warm water. TIP. If the flower has wilted and drooped, cut the stem again and place in boiling water for a second or two before putting it back in the cool water, this allows a quick flow of water to the head. Carnations: only ever cut the stem between the nodes because the flower won’t take any water if cut on the node. Lilies: always handle with care as these flowers are actually quite delicate and bruise easily. Best kept in the cool to slow down growing and always remove stamen to prevent the pollen from dropping. Gerbera: these have a tendency to go limp very easily so recut the stems and place in water immediately. Tip place wire netting across bucket full o water and place the gerbera through the netting stem down in to the water. This will encourage the stems to straighten. Ranunculus: although a fabulous looking flower they do have a tendency to go limp so cut the stems then wrap in tissue paper before placing in water. Chrysanthemums: although long lasting you should always take care to remove the lower leaves on the stem as they can wilt =badly and grow smelly bacteria below the water line. Again cut the stems. @sara - it may be a bi-coloured rose where the inside petal is a different color than the outside. However, I couldn't tell you what the name of it is as there are a few. You might want to do a bit of online research if you want to find out. It sounds nicely special though. When I pick my roses from the bush they are a brilliant red. But as the new buds continue opening, they open yellow! I don't mind this, just wonder if there is a name for it. It is amazing to pick a bouquet of two dozen red roses and their buds, and five days later the bouquet has turned into beautiful yellow buds all opened up!